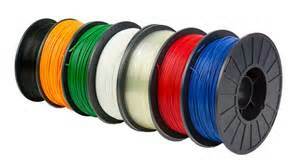 Standard PLA is a 100% annually renewable, biodegradable 3 D printing material that is easier on the environment than fossil-fuel based products. It has a quick transition from molten to solid, enabling it to provide more than other plastics. Workday PLA is a sustainable, bio-based filament made from the first ever resin designed from scratch to be used in 3D printing. It outperforms both standard PLA and ABS in strength, rigidity, resistance to heat and more. An excellent product for all around 3D printing.